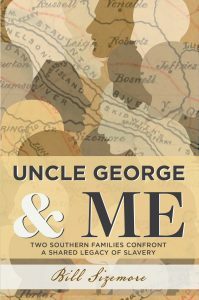 February is Black History Month, and that means I’ll have a flurry of events around the state talking up my book Uncle George and Me: Two Southern Families Confront a Shared Legacy of Slavery. Right out of the box on Friday, Feb. 1, I’ll be speaking at the monthly brown-bag lunch meeting of All Together Williamsburg, a wonderful homegrown racial reconciliation group. We’ll gather at noon in the social hall of Williamsburg Baptist Church, 227 Richmond Road. The next day, Saturday, Feb. 2, I’ll be back in Clarksville, Va., where the book is set, for a talk at the Clarksville public library, 914 Virginia Ave., at 1 p.m. Word is Uncle George Sizemore, the book’s title character, will be in attendance. Fairfax Lord of Life Church, 5114 Twinbrook Road, Fairfax, illustrated lecture sponsored by the Osher Lifelong Learning Institute at George Mason University, Wednesday, Feb. 6, 2:15 p.m. Fee; registration required. Portsmouth Colored Community Library Museum, 904 Elm Ave., Portsmouth, Saturday, Feb. 9, 1 p.m.
Community Center of Abingdon, 300 Senior Drive NE, Abingdon, Va., Sunday, Feb. 17, 3 p.m.